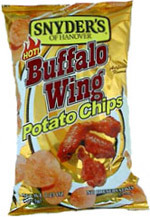 Taste test: Quite hot, and they actually do taste like buffalo wings. Ignore the nasty photo of Buffalo wings on the bag. Have celery and blue cheese dressing on hand for the full effect. We've had hotter, but we still had to drink a beverage with these. Smell test: These smell like buffalo wing sauce, especially the vinegar.